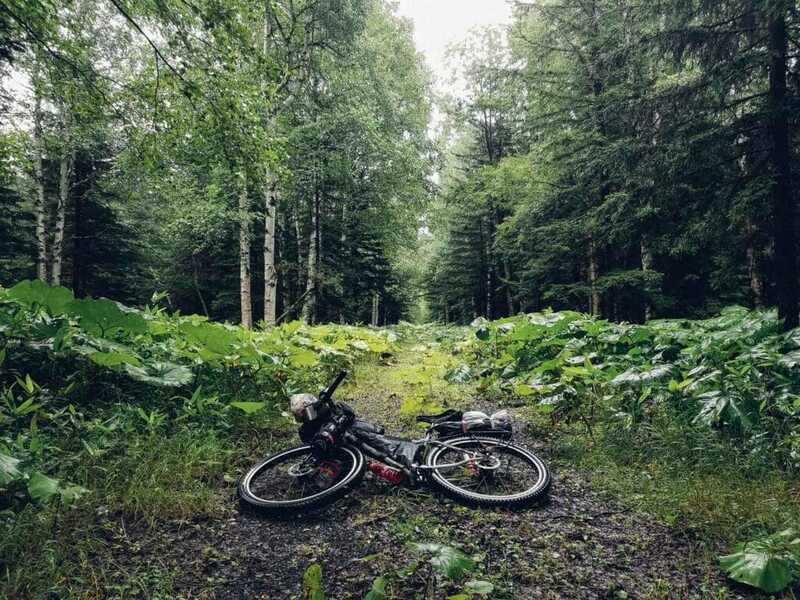 Depending on how you view the universe, the positive thing about being turned back yesterday is that today, we had an excuse to cycle over Hokkaido’s highest (Mikuni Pass | 三国峠 | 1,139m) and third highest (Sekihoku Pass | 石北峠 | 1,050m) pass. They’re both paved and in great condition. An absolute breeze after the last 7 days of tough riding. It was pitch black when we had an onsen last night here at Horoka Onsen, so I had to check it out in the daylight. 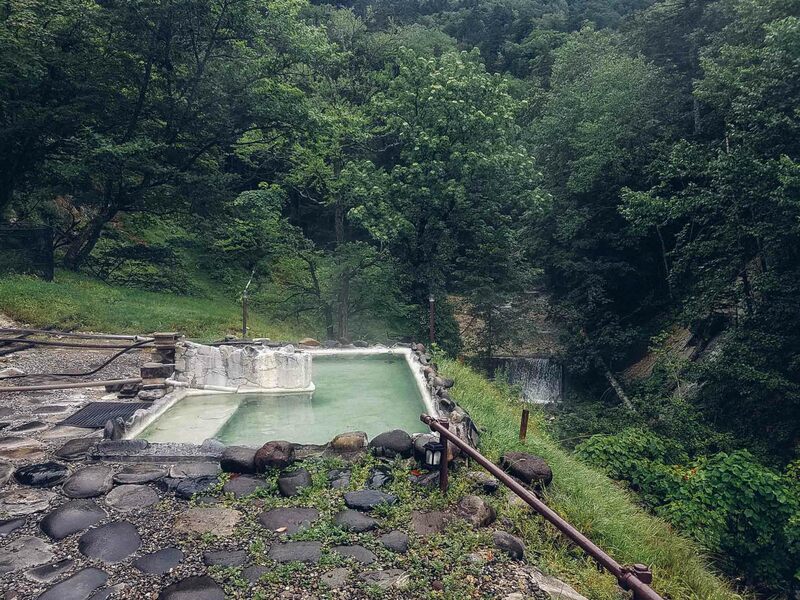 Horoka Onsen is one of the few remaining mixed-gender onsen in Hokkaido, but this morning it was just me and the birds. 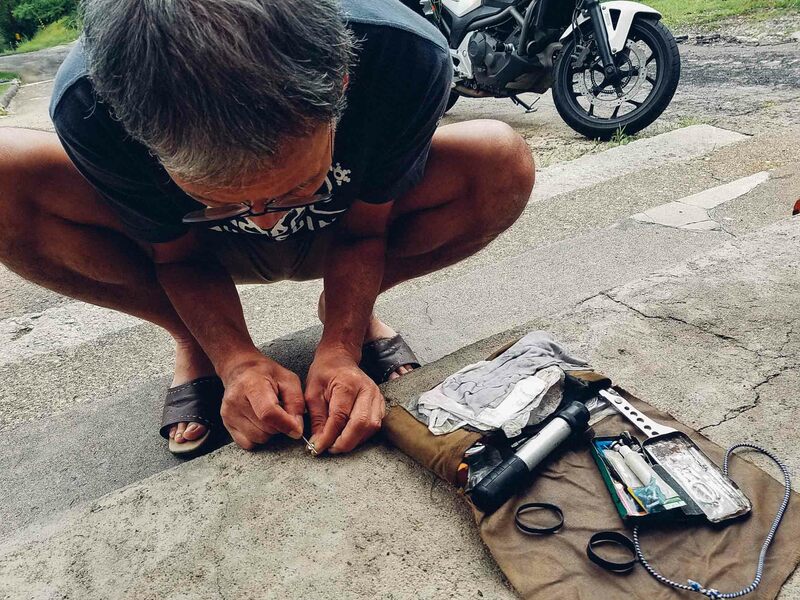 After breakfast, Tom and I sat down and did some repairs – namely fixing punctures we’d sustained the day before. What we hadn’t noticed, however, was that a spoke on Tom’s rear wheel was broken. 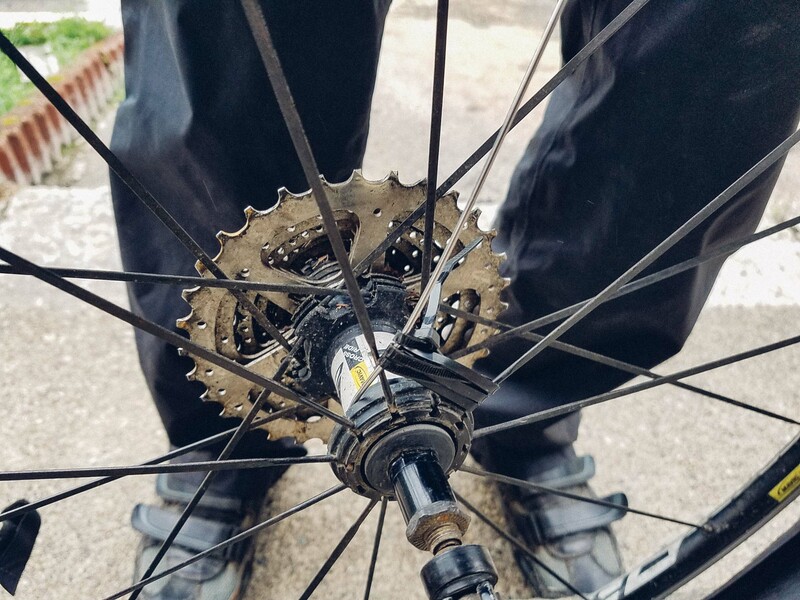 Those 24-spoke super lightweight wheels help keep his classic Specialized Headshock-equipped racing mountain bike super light, but the wheels have taken a beating over the last few days. 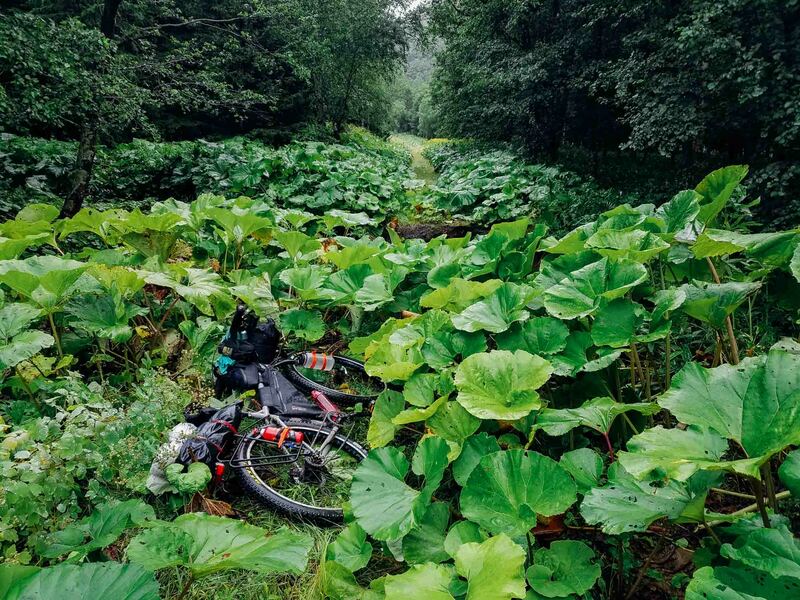 Another cyclist who happened to be staying at the onsen had a spare spoke. I wasn’t the right size, but he came up with a good temporary bodge that should help avoid any more failures on the remaining two days of this trip. We were happy to have dry-ish weather for the climb up to the top of Mikuni Pass. 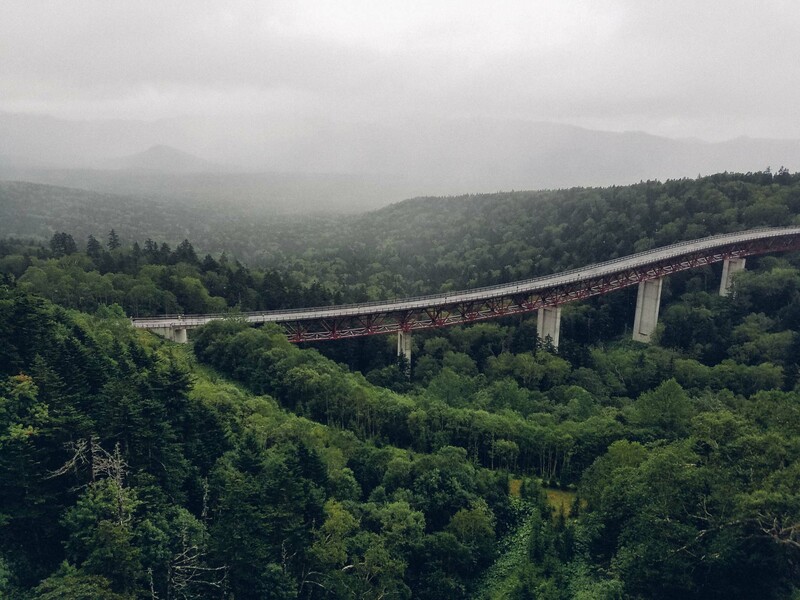 We didn’t get overly massive views, but the moody mist across the vast forest below was just as inspiring. On the other side of the pass, it was raining hard. Large rain drops stung my eyes, and on a few occasions made me begrudgingly pull on the brakes to slow down a bit so that I could maintain my vision. 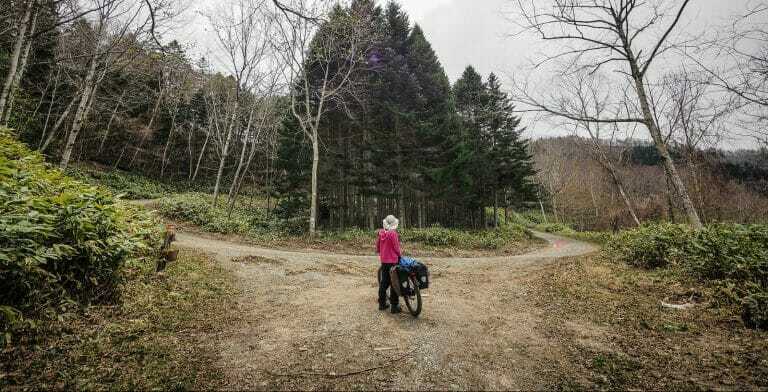 At the point that Route 273 from Mikuni Pass hits Lake Taisetsu, there’s the option to take a gravel road shortcut – the Rubeshinai Forestry road (ルベシナイ林道) – across to Route 39 that goes up and over Sekihoku Pass. 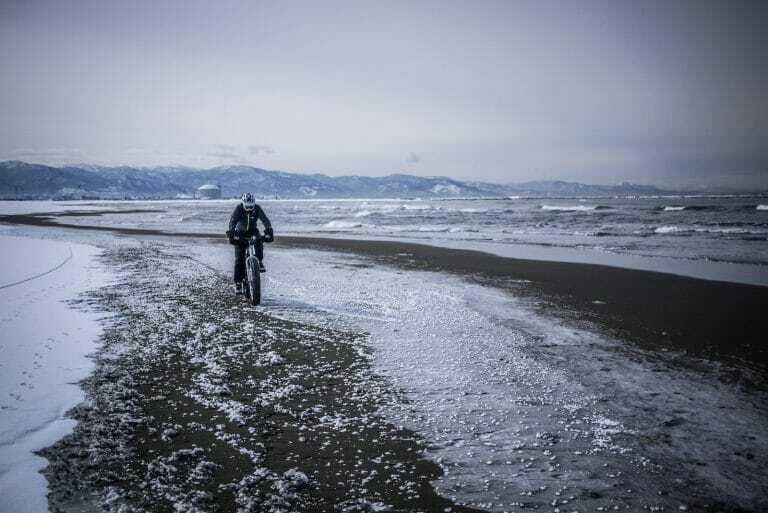 The alternative to this 6km stretch of gravel is an 18km detour down to the end of Lake Taisetsu and then back along the lake’s norther shores on Route 39. It was always the plan to do this shortcut, as it made the most sense in the spirit of a gravel road tour, and to save time. 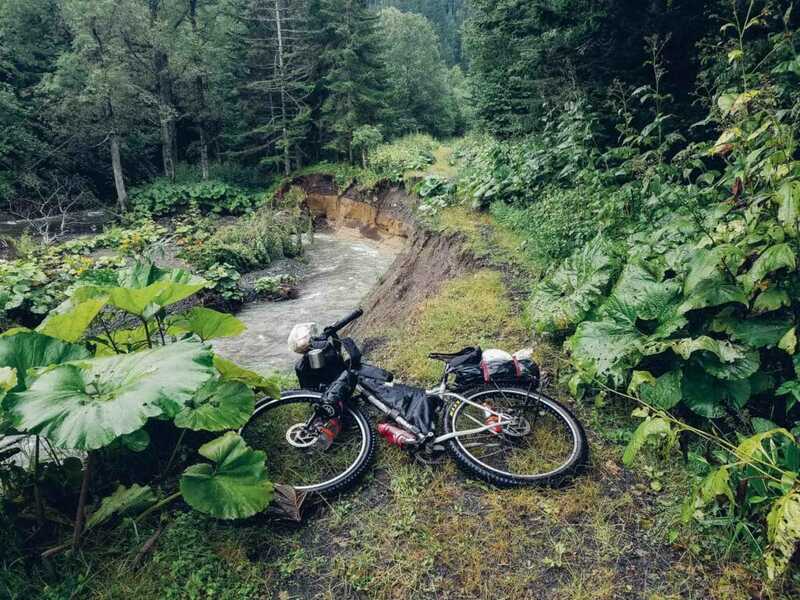 So when we got to the entrance of the gravel road, we gingerly started along it, hoping that we’d not encounter any of the washouts we’d come across two days prior on the Lake Oketo route. 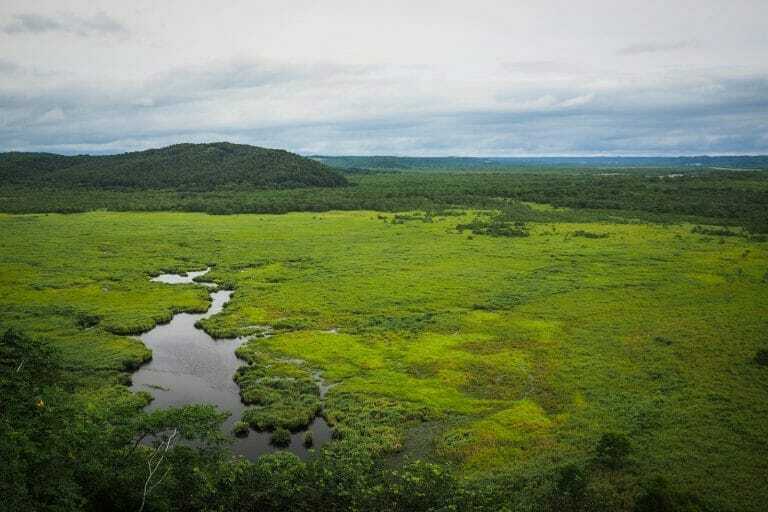 It wasn’t long, however, before we came to a large washout. The only way forward was to follow some deer tracks up and over a bluff to where the road continued on the other side. Citing PTSD from our experiences two days ago, Tom opted to turn back at this point and take the longer but much more guaranteed main-road route around the lake. I opted to see what was on the other side of this washout. If I came to another, I’d turn back. “I hope you make it,” Tom called back to me as he cycled back the way we’d come. “So do I,” I muttered under my breath. It turned out that this washout was the only large one on this stretch, with the rest relatively easy going along an obviously very disused road. Being alone in the Hokkaido woods can be quite eerie – every dark shadow looks like a bear. The gravel road spat me out onto Route 39 way ahead of Tom, so I just powered on towards Onneyu. 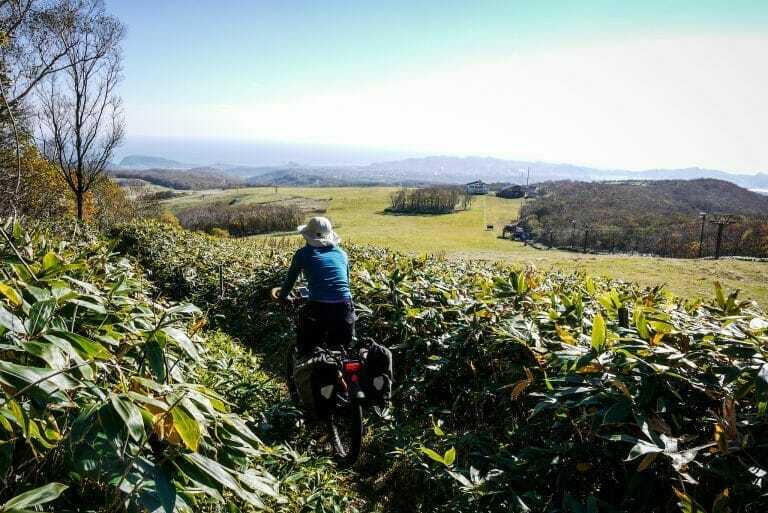 The climb up to the Sekihoku Pass wasn’t too tough, and the downhill was long and sustained. I finally rolled in to Onneyu just after dark. 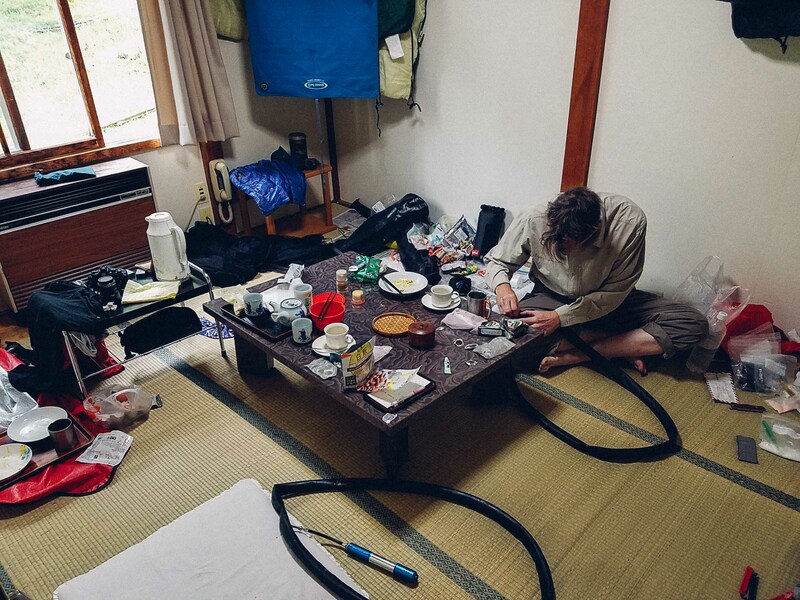 I grabbed some good from a food stall at the michi-no-eki roadside rest stop, and carried on to the campground. Not soon after Tom arrived, and we headed to the nearest hotel for a soak in the hot springs. Another varied and long day on the scouting tour done and dusted. NOTE: The start/end, as well as the onsen and accommodation below are for the original planned route. We ended up staying at the Onneyu Campground and we went to the nearest onsen here.